A beautiful, but not always wise friend once told me a story of infinite wisdom. She married a widower with children when she was in her mid-30s. The kids had fond memories of their departed mother, so the house was filled with art objects, furniture and photographic reminders of the deceased. Additionally, the widower maintained relationships with many people who knew his late wife. The maternal grandparents, of course, wanted to spend time with their daughter’s children. The husband’s parents did as well, and lived close by. Everyone held the departed in high esteem and affection. She had been an extraordinary person, now achieving a kind of virtual sainthood due to her early death. When my friend (who I hadn’t seen in years) told me all this, I asked what it was like to reside among the living reminders of her predecessor; in the midst of the physical mementos of her husband’s previous wife. It’s like living with a ghost. How do you do that?” I replied. First, you make friends with the ghost. Indeed, what else was possible? How could the almost palpable presence of this woman be denied? To ignore or discourage discussion of her or suppress her memory — put away the photos and other objects — would be a disservice to the children and risk their alienation. Surely, the only way forward was to “make friends” with someone she never met, a ghost guaranteed to defeat her if my friend chose to create a competition. Special days like Mother’s Day remained difficult. On such occasions she suffered the reminder of never giving birth to a child, but also that she was not the “real” mother to her husband’s offspring. Still, the best solution required honoring this woman’s memory; and the part of her living in her offspring and in their father’s memory. Sometimes life offers limited choices. Those situations must be accepted even if one wouldn’t have chosen them freely. My friend decided to recognize the woman who came before her: see her in the good qualities the children displayed — their beauty, their kindness, and their intellect — just as she came to think of her husband’s first wife as having encouraged a loving side of him she now enjoyed as his second wife. As I said, in all of this my “not always wise” friend was very wise indeed. 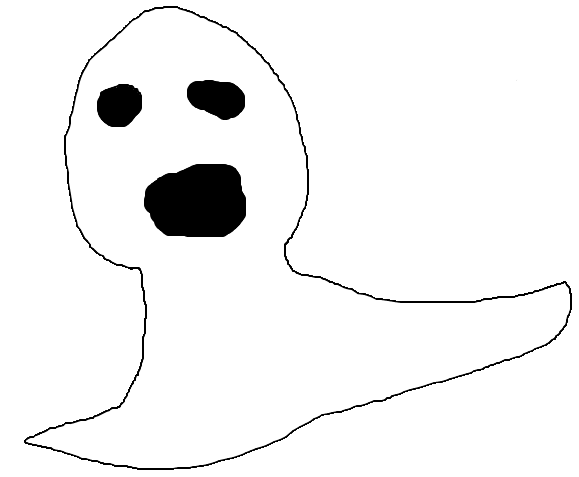 The top image is a Hand Drawn Ghost by Milonicia, sourced from Wikimedia Commons. The second painting is The Ghost of Vermeer van Delft by Salvador Dali. It came from WikiArt.org. A wise woman, indeed, Dr. Stein. In marrying the widower, she must’ve known the challenges that awaited her. Cross cultural and biracial marriages come with their own challenges. Forcing change between familial relationships cannot end well. This is brilliant and profound.